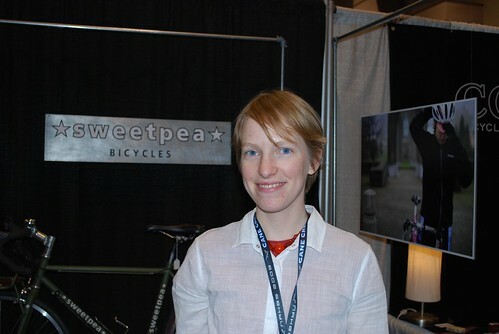 Natalie Ramsland is one of the principles of Sweetpea Bicycles and one of the few female framebuilders in the American bicycling industry. Earlier this year, Natalie participated in a panel discussion about City Bicycles in Portland, OR. Though “Women Specific Design” bikes are more available, many of these are either recreational sport bikes for athletes, or they are mountain bikes and hybrids that are too heavy for many women. I caught up to Natalie to ask about transportational cycling from the perspective of a woman. Are most women shopping around for bikes even aware that lighter options are available outside of high end racing bicycles? I would imagine that the Portland population sees a wider selection of what is available because there are so many cyclists trying to solve the same problems. Still, I think one of the bigger hurdles for women looking for a bike outside of high end racing bikes is raising their own expectations about what they deserve to be riding. I can’t believe the number of ladies I hear say things like “oh, I am not really fast, I am not really a cyclist,” and yet they commute to work, carry kids and groceries, etc. The bike industry could certainly do a better job of acknowledging the diversity of athleticism and building that in the way women’s bikes are designed and sold. What is a city bike to you? 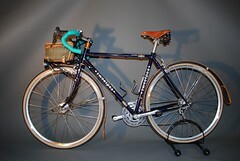 The bikes I have built reflect the varying interests and riding styles of my customers. That is the joy of custom building, no? But some of the bikes I am most proud of are those that are honest-to-goodness vehicles. The cyclocross commuter I built for my brother’s daily SF commute certainly looks different than the Farmer’s Market bike. And both of those are different still from my around town bike. But what they have in common is the ability to carry a load (rack) and the ability to function comfortably all year (fenders). I think that the more subtle feature that these bikes have in common is perhaps the most important though: 1) they each fit their rider as comfortably and uniquely as their favorite pair of jeans, and 2) they each indulge personal quirks or preferences. My bike for example has a longer top tube than most bikes that size because of my unusually long torso, which makes it more comfy than any other bike I have ridden. In terms of reflecting my aesthetics sense, I opted for 650c wheels rather than 700c because to my eye the smaller wheels look more proportional and more beautiful. When women come to you for a bicycle, are they looking specifically for a “city bike” — something to commute on? Do they know what to ask for? There’s always a really good reason why my customers are looking for a Sweetpea. It might be that they want a racing bike in a really small size, or a long distance bike with a short enough top tube, or a bike is built completely and unapologetically with all of their dream bike features in mind. The ultimate form of the bike is the result of their intentions for the bike and the custom fitting we do to determine their optimal riding position. Sometimes this makes a bike a “city bike” and sometimes it makes the bike a sunny day, carbon-forked speed queen. But I always remind customers that they are going to love their Sweetpea so much that they won’t want to ride their “back up” bike in rainy weather. As a result, I’ve put a few more fender eyelets on the road. Do women typically have more safety concerns than men? Besides the usual “5 Es” to promote bicycling (Engineering, Encouragement, Enforcement, Education, Evaluation), are there other things to look at from a woman’s perspective to get more people on bikes? I don’t know if there are more safety concerns for women, but I suspect that the broader scope of women’s responsibilities (work, caregiving, schelppin’) plays some role in female ridership. It’s easier to be the heroic bike commuter if you’ve got somebody else picking up the dry cleaning and shuttling Johnny off to soccer practice. It seems that too often that somebody is female. I think the good work of feminism is part of the solution but the other part is building bikes that are viable and appealing means of carrying groceries and kids and all that good stuff. 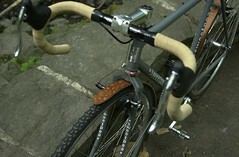 Be sure to visit Sweetpea Bicycles in Portland. The blog is cool, too! I think you meant SweetPeaBicycles.com. Very interesting reading, particularly about the bike being as comfortable as one’s favourite jeans. In the UK, I’m only aware of one customised bike builder http://www.specialbike.com, and I’m really interested in going down that road, though in truth specialbike only upgrade your favourite bike, which is not the same. Can anyone point me towards a customised bike builder in the UK? Just enquiring at this stage, I should imagine it’s an expensive exercise. Bob Jackson does custom work in the UK. Looks just like my 1960 ‘Esquire’ built by Raleigh.